The conservation of tropical rainforests and other biodiverse ecosystems in the (sub)tropics faces tremendous challenges. Simply declaring that a region becomes a conservation area without taking away the pressures that threaten the integrity of the area, doesn't work. The social and economic needs of local populations have to be taken into account. And this is where many conservation projects often fail. Biochar, a technique to boost the fertility of poor tropical soils, could help in solving this particular problem. Forest conservation projects are confronted with pressures that range from the global (e.g. the expansion of agriculture in response to global market forces) to the very local (e.g. slash-and-burn farming by poor rural people who rely on this technique to survive.) The global forces are difficult to control, but the local pressures can be addressed. Most conservation projects will attempt to search for alternative livelihoods for the local people who used to depend on the ecosystem that is now to be protected. But this in itself is a major challenge. Not all people who live in and around a conservation area can be employed in ecotourism, for example. And these populations still need food, energy and social services to meet their basic needs, so the pressures on the conservation zone will remain. When a conservation project turns local farmers into forest guards or tourism guides, the farming activities may be phased out in the immediate vicinity of the area, only to pop up elsewhere because local demand for food, fiber, forest products and energy does not disappear. This phenomenon, known as 'leakage' is one of the weak points of most current forest conservation efforts. In some cases, projects may even generate 'conservation refugees' - people who are chased away from their land that is turned into a protected area, and now need to fend for themselves elsewhere. In extreme cases this violence can involve the use of military force (see the brilliant overview in the forthcoming book by Mark Dowie, Conservation Refugees - The Hundred-Year Conflict between Global Conservation and Native Peoples, MIT Press, May 2009). However, nowadays most conservation efforts are 'hybrids', in that they no longer militarize conservation areas, but instead open them up so that local people can keep benefiting from their land and forests. However, this requires complex and expensive transitions from rudimentary land use techniques - such as slash-and-burn farming - to more refined concepts, such as agroforestry. The emergence of a growing market for ecosystem services may greatly help forest conservation projects, because this market would generate extra revenues that can tackle some of the challenges. The funds may flow towards the people who would else have been displaced by the project or whose livelihoods need to be transformed to make it work. How is this possible? It is easy to understand. Biochar is a carbon-rich product obtained from the pyrolysis of biomass. When this porous, recalcitrant substance is added to acidic, nutrient-poor tropical soils -- the infertile soils that push people in tropical forest areas to rely on slash-and-burn farming -- the soils become far more fertile and productive. Biochar does this by positively altering the fundamental biological, chemical and physical properties of these problem soils. Among other things, biochar makes soils less acidic, enhances their nutrient and water retention capacity, increases their cation exchange capacity, and aerates the soil. Biochar can thus short-circuit the slash-and-burn cycle, make subsistence farming at the forest frontier far more productive, and thus reduce local pressures on forests. More food, fiber and biomass can be produced on a plot of land that has been amended with char. In some cases, grain yield increases of 880% have been recorded when highly weathered soils received biochar and mineral fertilizer, as compared to the same soils only receiving fertilizer. Depending on local circumstances, a single hectare of farm land amended with biochar can protect some 5 to 20 hectares of pristine forest. What is more, biochar not only enhances the productivity of poor tropical soils and thus reduces pressures on local ecosystems, it also doubles as a stable, permanent carbon sink. That is: it helps fight climate change. In the future there should be carbon credits available for sequestering biochar in soils. Biochar projects could thus generate two types of carbon credits: direct credits obtained from storing recalcitrant char in soil, and indirect credits obtained from avoiding deforestation. 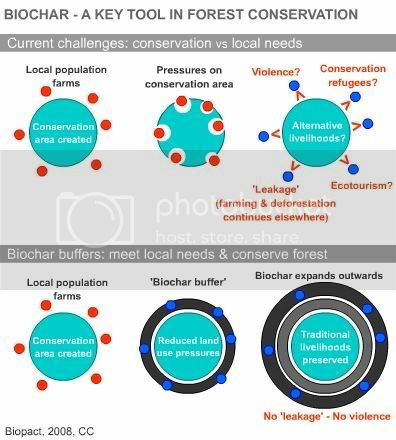 When biochar projects are linked to conservation areas, a potential synergy emerges that can overcome the gap between the economic needs of local rural populations and the requirement to reduce pressures on the protected zone. By creating 'biochar buffers' around forest areas, local farmers could keep on farming and supply local populations with food, fiber, fodder and forest products. Because their fields are now far more productive, their farming activities would not threaten the conservation area. Farmers would remain farmers. Conservationists would not have to transform the local people's lives by inventing entirely new jobs for them. At the same time, the risk of 'leakage' is reduced as well: food and biomass production will not be displaced, but remains locally rooted. Moreover, biochar's capacity to restore the fertility of depleted soils makes it possible to expand these 'biochar buffers' outwards, away from the conservation area. Without biochar, local farmers would work their way inwards, toward the protected region as their soils deplete and they need new land. They would thus threaten the integrity of the conservation zone. With biochar, abandoned farm plots with their depleted soils that no longer yield food, can be taken back into production. One of the key pressures on forest conservation zones, namely land clearing for farming, would thus be deflected and even turned around. As biochar zones expand outward and keep generating enough food and biomass on previously abandoned land, the margins around the conservation area can gradually be reforested. The concept of creating 'biochar buffers' around conservation areas needs to be explored further. The way we presented it here is crude and many questions about the feasibility of such a concept remain. But the growing evidence of biochar's capacity to keep soils productive, especially at the tropical forest frontier, hints at a potential synergy between conservation and local development. Christoph Steiner: Slash-and-char as Alternative to Slash-and-burn - soil charcoal amendments maintain soil fertility and establish a carbon sink, Cuvillier Verlag, December 2007. On conservation projects that generate 'conservation refugees', see the work of an NGO that grew out of resistance to the creation of a natural park in the Omo valley of Ethopia: Native solutions to conservation refugees. Mark Dowie, Conservation Refugees - The Hundred-Year Conflict between Global Conservation and Native Peoples, MIT Press, May 2009.
one of the best things around. I'd like Erich to do some actual empirical research rather that jumping into conclusions based on things he found from the net. I think you miss understand, I posted this rebuttal against BFW because Lorenzo was so upset by them, as was I.
I have been an unrelenting advocate of Biochar for the past three years.